Doncaster RLFC showed just how highly they rate Papua New Guinea international centre Jason Tali when recently handing him a new three-year contract. The length of the contract not only underlined the club's determination to hold on to one of their best players but also their ambitions to become a competitive force in the Championship again - ambitions shared by Tali. The Dons moved quickly to tie up the strong-running Tali when clubs in both League One and the Championship started to take an interest in him knowing that he was out of contract at the end of the season. “I’ve been happy at Doncaster,” said Tali. “There are a lot of good people in and around and the club and I see the club is going places and that’s why I signed the new contract. Despite making a delayed start to his first season in 2016, Tali finished that campaign as the Dons’ top try-scorer and shared the honour with Kieran Cross last year. Virtually unstoppable at League One level on a one-on-one inside the opposition 20, Tali looks to be on course to finish as the club’s top try-scorer again. Having touched down in the last two games Tali hopes to make it a hat trick in Sunday’s visit to Wrexham-based North Wales Crusaders. “It’s a game that we are expected to win but there are few easy games in this league, especially away from home, and we have to go into every one of them with the right attitude,” he said. 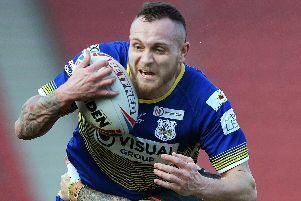 The Dons made virtually certain of a play-off spot when beating Keighley at the weekend and Tali is hoping for a better outcome than two years ago when the club’s injury-hit side were well beaten in the semi-finals by eventual champions Barrow. “Provided we don’t pick up any serious injuries in the next two games we will be going into the play-offs much better placed,” he said.